Happy Friday! Cannot wait for the weekend and hopefully some Spring-like weather finally! Bananarama Love and Mango Mania. Bananarama Love is a sheer, yet creamy yellow jelly, one - two coats are shown in my swatches below. Mango Mania is a pure orange jelly. I can see myself using this for some squishy syrup nails! This was the most true to being a jelly out of the three I picked up. One - two coats are shown in my swatches below. Creme de Mint and Be My Clover. Creme de Mint is a sheer, yet creamy medium green jelly, one - two coats are shown in my swatches below. By My Clover is a deep blue jelly-ish base with golden teal shimmer. This kind of reminds me of OPI's Catch Me In Your Net (and the rest of the dupes) now that I look at it again. I may do a comparison to se how similar they actually are, but if my memory serves me correct, By My Clover is more opaque. Two coats are shown in the swatch below. Next Stop, Sally's! Unfortunately I did not find The Grass is Lime Greener and At Vase Value, there were actually only two spring shades in the display and I already owned them (I was actually wearing one as well). I luckily I was still able take advantage of the last few days of the BOGO China Glaze promo with the purchase of their latest Surprise! collection. Don't Be a Flake and Glimmer More. Glimmer More is another glitter topper which consists of small metallic magenta hex glitter and pink, yellow and peach matte hex glitter. I used one coat in the swatch below, however It was more of a dabbing motion than a stroke when applying. Don't Be a Flake is a glitter topper which consists of a clear base and holo baby pink, matte black and mate blue hex glitter. Two coats are shown in the swatch below. Last stop on my shopping trip was Big Lots. I had heard that Sephora by OPI's were popping up in several locations, but the store I frequent never really carries the fun polish stuff. To my surprise I found some great polishes... all for $1.80 each! 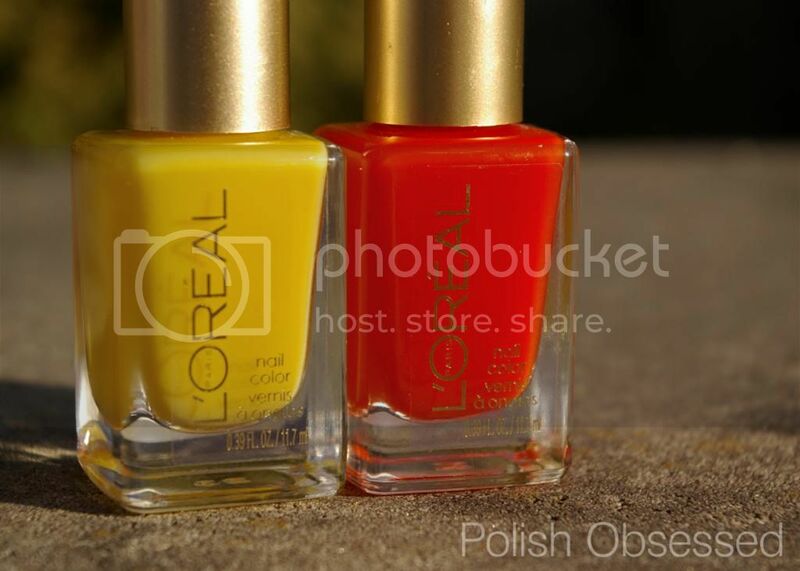 I must say I was kind of disappointed to find some polishes I already owned (and purchased at FULL PRICE originally). Indi-go With the Flow and Spark-tacular! Top Coat. Indigo With the Flow is another glitter topper made up of light cornflower blue hex glitter in various sizes. It reminds me a lot of Essie, Stroke of Brilliance now that I see it on the nail wheel. Two coats are shown in the swatch below. Spark-tacular! Top Coat is a glitter mix of small, medium and larger hex glitter in a variety of colours; green, yellow, orange, blue magenta and silver. Two coats are shown in the swatch below. 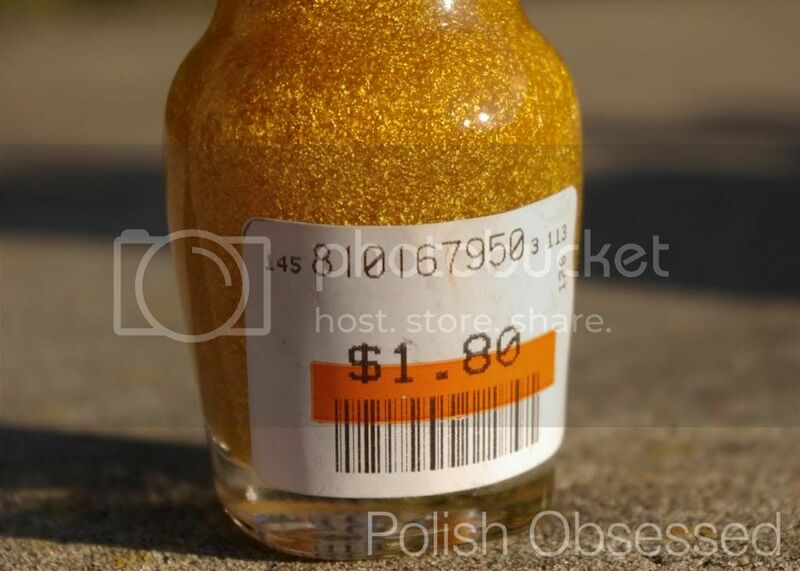 I Found a Pot of Gold and It's Real 18K Gold Top Coat. 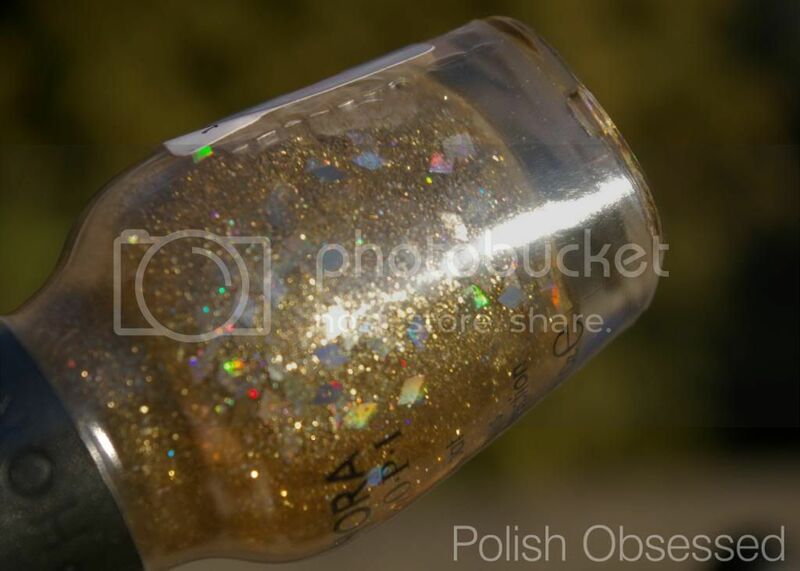 I Found a Pot of Gold is a gold glitter made up of micro and small gold and holo glitter, scattered with larger diamond shaped gold holo glitters. I had to fish around a bit to get the diamond glitters on the nail. If I were to use this for a full mani I would leave the bottle upside down over night in an attempt to get more of the diamond glitters on each nail. And last but not least, It's Real 18K Gold Top Coat. It's exactly what the name details, shards of actual gold pieces in a clear base. This polish sold for more at Sephora than the other Sephora by OPI's, however I still got this one for $1.80! I was never a huge fan of the gold/silver top coats, although I must say I does look nicer in person, and I figured for less than $2.00 it was worth trying out. Two coats are shown in my swatch below.